The trades were struggling to rev back up after the passage of the trough, and even the sea breeze was unmotivated since the sky had been overcast for most of the day - it was not even kiteable on the beach. Cloudbase was on the low side, at times down to two grand or so. But even in the face of such slim odds, six pilots showed up at Kahana with high hopes. I hiked up first and launched into gentle but sustaining lift, then proceeded to torment the other guys mercilessly with toplandings, touch-and-gos and fly-bys as they trudged up. Jim bombed out with a stick in his lines on his first attempt, but gamely hiked back up for a retry. Don, Jeff, Ray and I had an easy time getting up to cloudbase quickly, and Ray was excited about getting all of us organized to stage a downrange regatta. Thom heard the plans and offered to retrieve us, having given up trying to kite on the beach in no wind. But Jim and Bill were still on launch, and the cycles down there were backing off to an ominously light level. Our cross country regatta plans were in doubt - it was getting late, and the clouds weren't getting any higher. As Jim and Bill got ready to launch in what was clearly the lightest wind of the day, the first four of us in the air made a tough decision: we left our buddies behind and bailed to Punaluu. As consolation we made a half-hearted promise to wait for a while on the next ridge to see if they might be able to get up and come join us. The four of us plummeted down through sinky air across Punaluu Valley to arrive low at the next ridge, wondering if we'd be able to work our way back up. But we were relieved to find smooth lifting air at the Punaluu ridgeline, and we were able to ride the ridge all the way back to where the ridgeline meets the main Koolau range and disappears into the clouds above Sacred Falls. And to our relief, against the odds, we finally saw two tiny specks rising slowly above the Kahana ridge - Bill and Jim had bravely scratched their way up from what should have been certain sled rides. And just as their impatient comrades were about to continue the mission further downrange, they called over for us to wait for them as they tanked up and headed across to join us. Jim arrived last at the foot of the Punaluu ridge, and struggled down there for a while, at one point stomping his speed bar to escape a momentary leeside situation - and snapping his speed line. He thought about landing at that point, but we convinced him that no one would need a speed bar on this kind of day anyway - keep working that light lift and get up here! 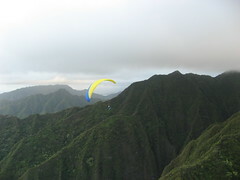 We finally gaggled up six gliders at cloudbase along the green walls of Punaluu, amazed to be flying in such a crowd up there all together, frolicking in the mist and making occasional forays back along the main ridge towards Makapuu. Apparently Frank was flying at Makapuu and heard us on the radio, so Jeff conveyed our happy airborne salutations. As the clouds thickened and the sun sank low behind the main range, we proceeded to the next ridge behind Hauula. There we found the lift harder to work, but some of the braver souls among us plunged deep into the back of Sacred Falls Valley to find the good stuff. It was good stuff all right, but on the way back out we found some pretty bad stuff too, in the form of strong turbulent air swirling up and around the crenelated peaks back there. As darkness drew closer, we finally dispersed and headed out from the Hauula ridge on various paths towards Pounders: some of us flew along the low forested foothills to the last hilltop behind the shopping center, hoping to tank up and extend the flight just a bit longer, while others flew directly out over the water and turned to follow the shoreline. It was blowing pretty hard as Jim and I arrived together at the last foothill, so I engaged my speed bar and headed for the beach, encouraging Jim to do the same. Except, of course, he didn't have one any more - but luckily he made it out of there just fine. Six of us swooped down out of the crepuscular gloom to storm the beach with a rapid succession of commando landings, in the usual brisk Pounders conditions, and we lugged our tired wings to the grass to fold up. Thom soon found us and went the extra mile by delivering refreshing cold beverages to each of us as we packed up. What are the odds of that kind of service from your retrieve driver? For that matter, what are the odds that six top pilots would show up at Kahana on a weekday afternoon? Or that they'd all be ready and willing to fly a late downrange mission? I fly with the Earls almost daily, but I haven't flown with Don, Ray or Bill in quite a while. Bill was in extra high spirits after a clean report from his latest CAT scan. Talk about beating the odds! Yeah, sorry Frank, we definitely didn't mean to mislead anyone about the how epic that XC flight was - I can see now how that would have been confusing. 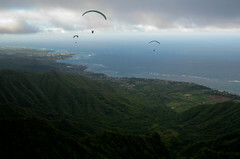 The XC flight was Kahana epic, not Makapuu epic. It was just the usual ridge hopping from Kahana, with a little added drama. I don't think anyone would have even considered a Makapuu downrange trip with the clouds that low. Low cloudbase XC trips are definitely one of our strong points out here. We were calling it Greenwalls back there, but it's not nearly as much of a big sheer green wall as the real thing over there in Waimanalo - the wall behind boogaland is less like a green wall and more like a big green man trap! It sure has claimed a lot of pilots over the years, including me. We didn't quite get far enough back around to do any recon where you had your old reserve ride landing, Frank, but on the right day that could be a great tour.